Thanks to Dr. Chungja C. Shim, Titusville Area Hospital, Pennsylvania (USA), for contributing this case. To contribute a Case of the Week, follow the guidelines on our Case of the Week page. 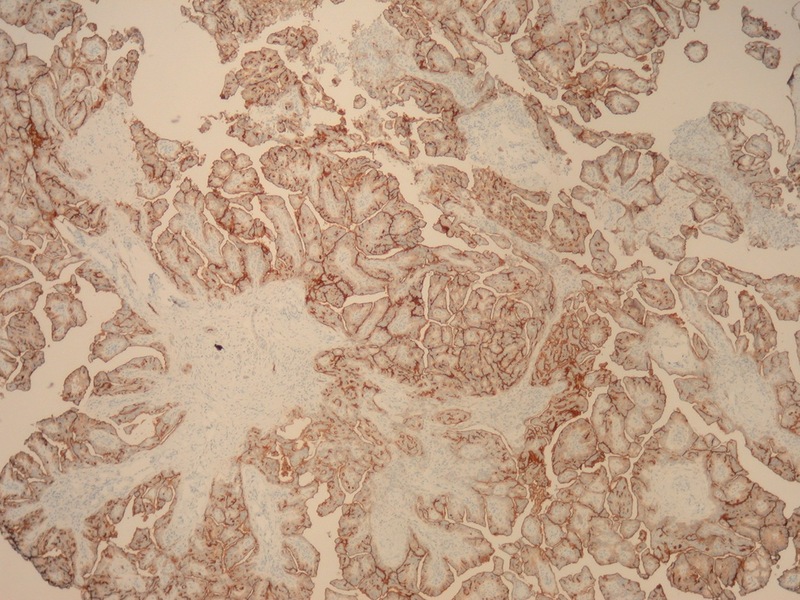 Reproducibility of histopathological subtypes and invasion in pulmonary adenocarcinoma. (1) We updated the Pancreas chapter based on reviews by Deepali Jain, M.D. 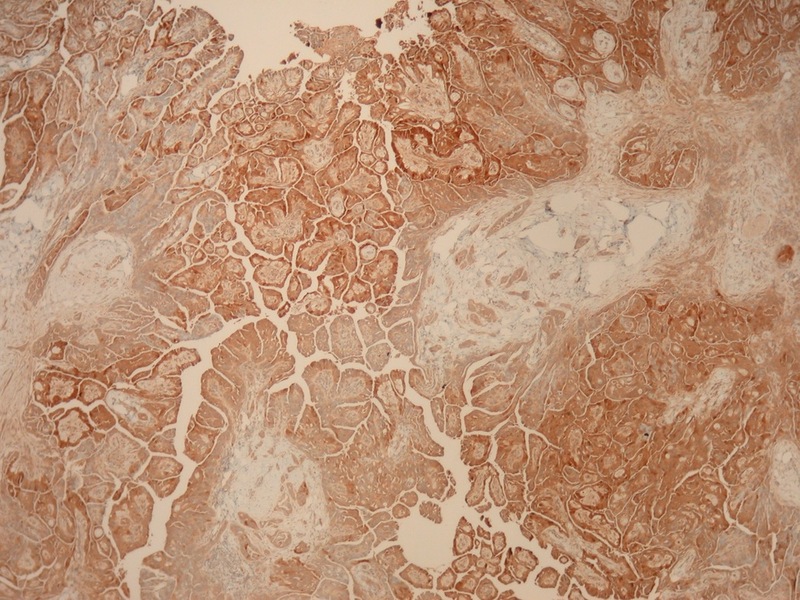 We also added a large number of references and images from the AFIP Fascicle on Pancreas (3rd series) and other sources. (2) On Tuesday, 4 December 2012, we had 16,131 visits, a record for 2012, and close to our all time record of 16,190 on Tuesday, 13 December 2011. Thanks for your support! (3) If you are making purchases at Amazon.com, please first click on one of our Home Page Amazon.com banners, or a link on the Books pages, or by clicking here. This helps fund our free website, because Amazon pays us a referral fee out of their profits. (4) Our Feature Page for December highlights Grossing Equipment / Workstations, and includes Exakt Technologies, Leica Microsystems, Milestone Medical, Mopec, Photodyne Technologies and Sakura Finetek USA. We also have a new Mystery Case on the right side of the Home Page. (5) Visit our new Lippincott Williams & Wilkins books page, listing 60+ of their books, as well as our newly updated AFIP, CAP and WHO book pages. A 11 year old boy was initially seen for a left hydrocele. Ultrasound showed only the hydrocele. 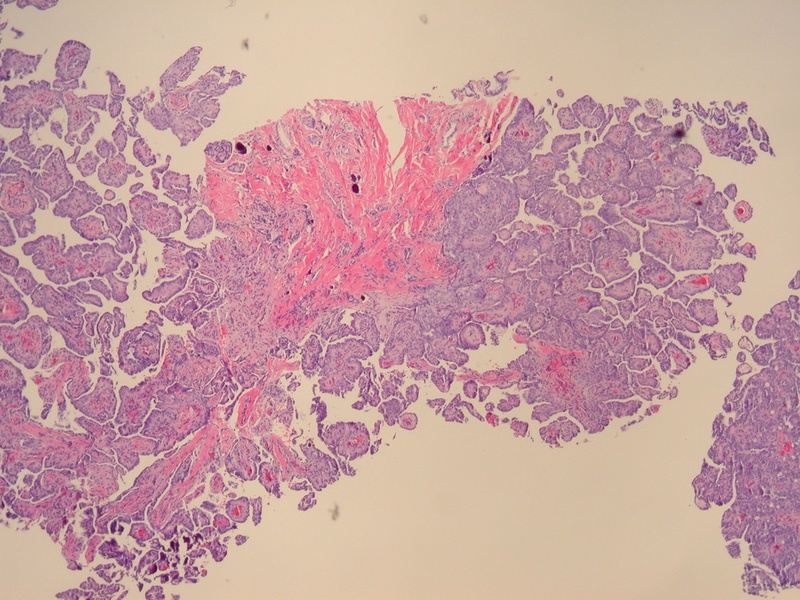 At surgery, multiple papillary lesions were present on the tunica, which were biopsied. An orchiectomy was performed. 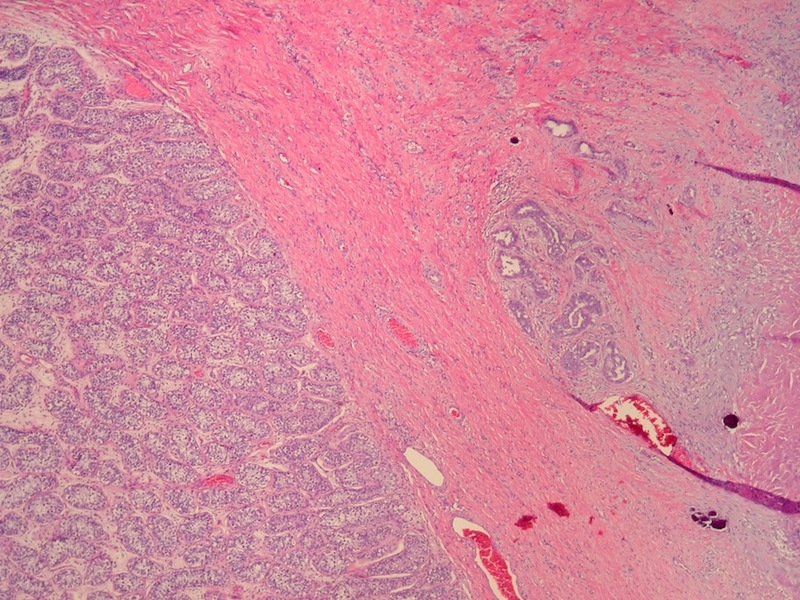 The orchiectomy specimen showed multifocal involvement of the papillary tumor on the external surface with no testicular parenchymal involvement. 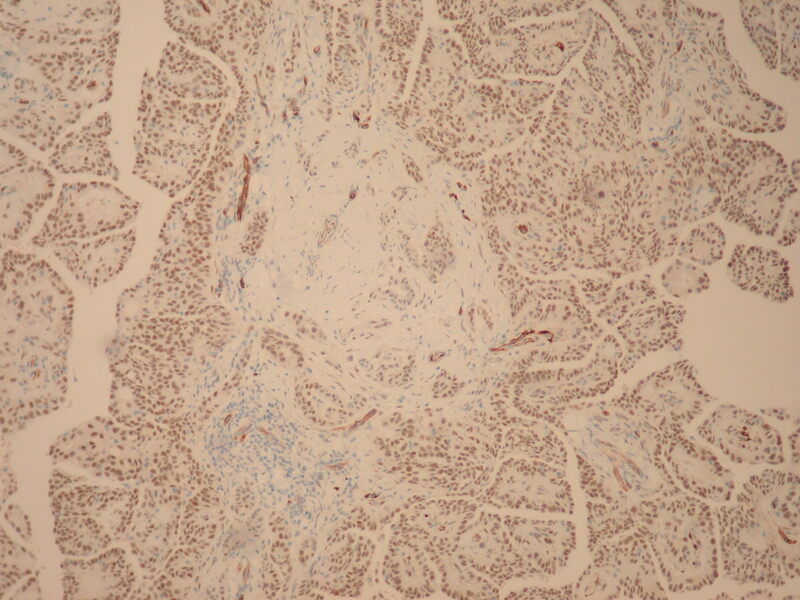 Immunohistochemistry indicated that the tumor was diffusely positive for Calretinin, WT1 and Mesothelin, as well as CD56, CK7 and CA125, with focal staining for EMA, p16, CK5/6 and p53 and negative staining for desmin, MOC31, C-kit and BerEP4. 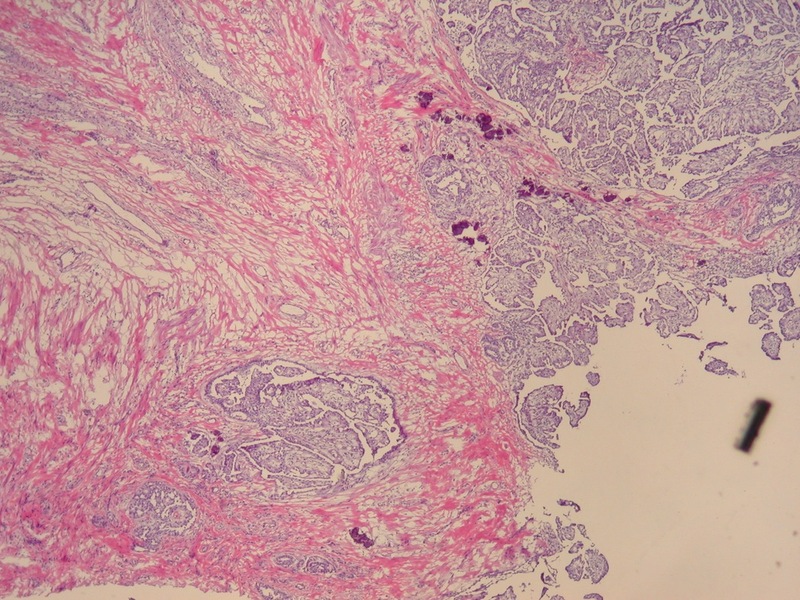 Mesothelioma of the testis originates from the tunica vaginalis, which derives from evagination of the peritoneum into the scrotum. This rare entity has a mean age of 54 years, but can occur in children (Am J Surg Pathol 1995;19:815, Mod Pathol 2010;23:1165). 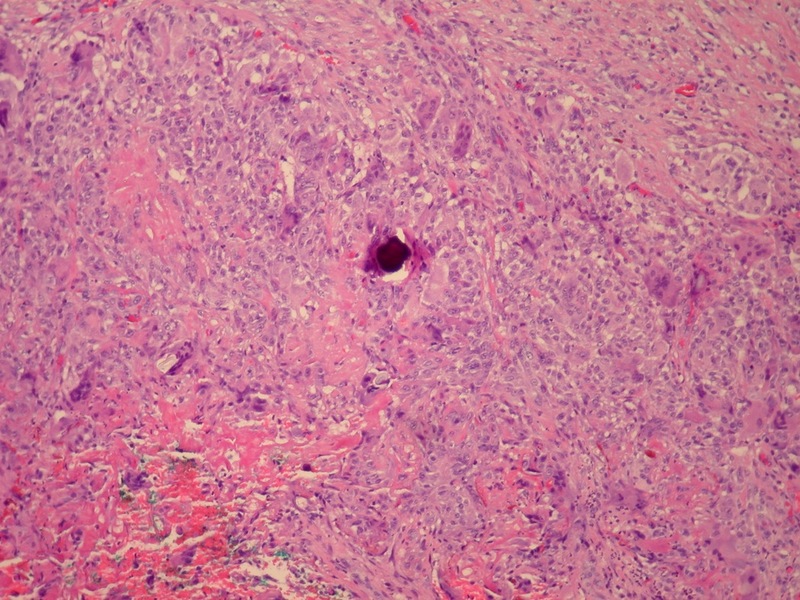 It is associated with asbestos exposure (BJU Int 2012;110:533, Cancer 1998;83:2437), and often presents with hydrocele. 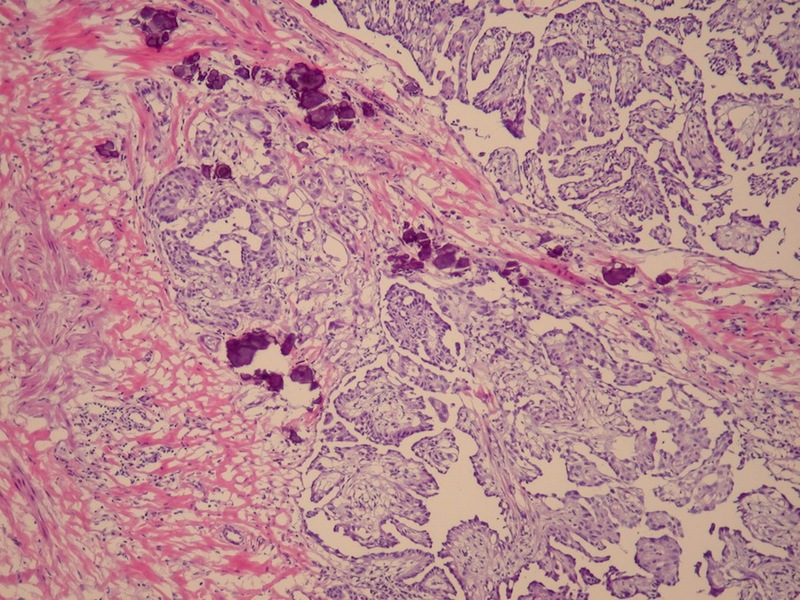 It has a papillary or tubulopapillary pattern with a single layer of atypical mesothelium overlying a fibrovascular core. 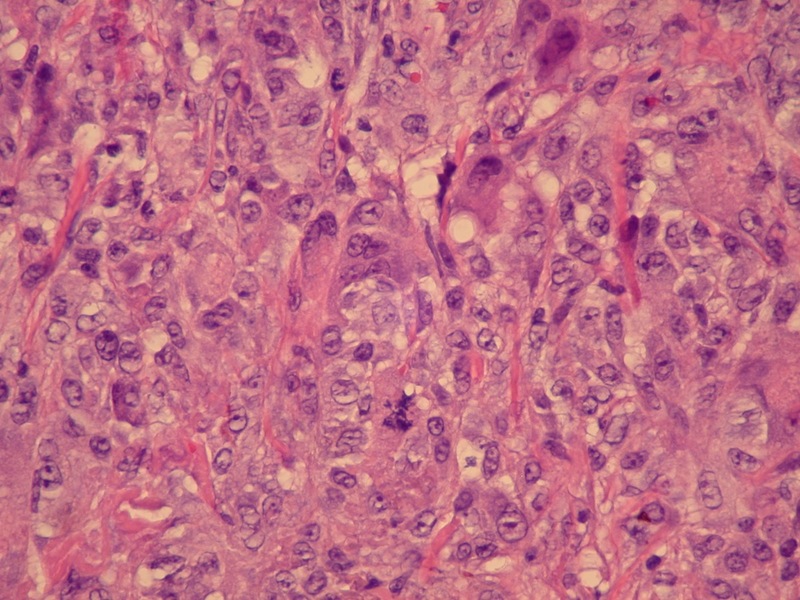 The tumor cells are typically epithelioid, not spindled. 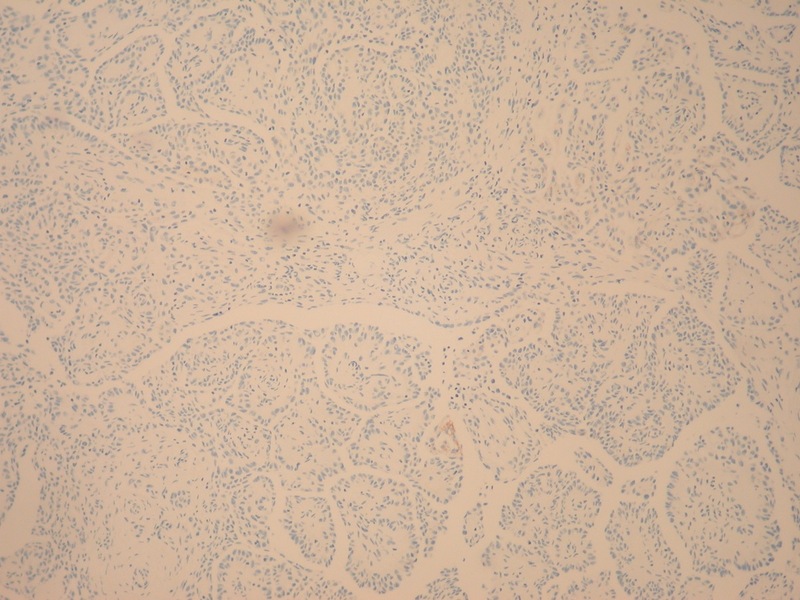 Stromal invasion is present, and psammoma bodies are variable. 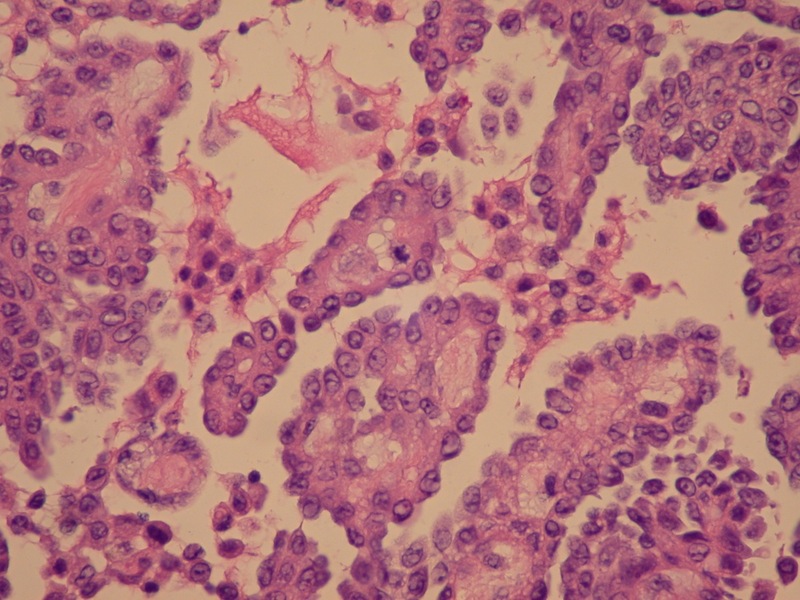 Mesotheliomas of the testis, as at other sites, are immunoreactive for calretinin, EMA, thrombomodulin and CK7, and negative for CK20 and CEA (Am J Surg Pathol 2006;30:1). Treatment is radial orchiectomy, but these tumors are aggressive, and the median survival is only 1-2 years (Arch Pathol Lab Med 2012;136:1).